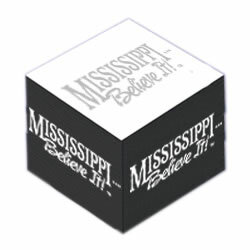 Adhesive Note Pad - Mississippi Believe It! SKU: 104. Category: Put Us To Work. If you meet a “disbeliever,” stick it to ’em. Show them you believe in Mississippi … and, while you’re at it, write a little note telling them that, throughout the 189 years of Mississippi’s statehood, untold numbers of our citizens have made marvelous medical advances, entertained the masses, invented products that do everything from make lives better to improve space travel … and that’s just to name a few of the state’s successes!